The link below will allow you to securely buy a signed, personally dedicated copy of E.J. Rudsdale's eye-witness account of life on the home front in Britain during the Second World War. E.J. 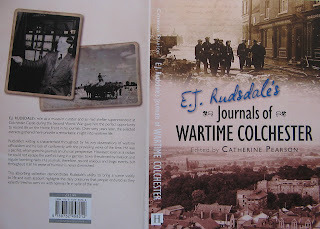 Rudsdale's journals provide a remarkable insight into life in Britain during the Second World War. Rudsdale recorded his experiences of living in a garrison town in the East of England, which was threatened by invasion and regular bombing raids. He also chronicled the changes he witnessed as a museum curator and air raid shelter superintendent at Colchester Castle, the impact of the War Agricultural Committees on farming communities and the work undertaken by the Royal Observer Corps. Rudsdale recorded the impact of air raid attacks on his home town of Colchester and on the county of Essex and witnessed the building of new aerodromes to accommodate the arrival of allied troops. His journals, therefore, form an important record of anxious times and tragic events but throughout it all his sense of humour is never diminished for long. The publication of the book has been supported by the Essex Heritage Trust and the Hervey Benham Charitable Trust. The book has been featured on BBC Radio 4's Making History programme. The book draws mainly on extracts which do not appear on E.J. Rudsdale's blog. Please make sure that you click the correct button for postage. The postage to UK destinations is £1.50 and the postage cost to the rest of the world is £7.00. Delivery should be within a week to the USA and within 2-3 days for UK addresses. Please add the details of the dedication you would like in your copy of the book in the appropriate box below. The first box and button is for UK addresses only. The second box and button is for non-UK destinations. The book is also available to purchase from The History Press, Waterstone's and Amazon. If you are visiting Colchester, you can buy the book at Red Lion Books, Colchester Visitor Information Centre at the Hollytrees Museum and WHSmith. If you would like any further details, please contact me. Born on 14th February 1910 in Colchester, Essex. Began work at Colchester Castle Museum in 1928. Catherine Pearson, 2019. Awesome Inc. theme. Powered by Blogger.